Legendary homicide detective Jack Dantzler has never failed to solve a murder. Thirty-three killers apprehended, tried, convicted. Perfect, like God's soul. But Dantzler's perfection ends when three college women are brutally murdered, victims of a serial killer who strangles his prey, decorates their bodies with a St. Jude medal and photo of Michelangelo's Pieta, then lacerates the jugular post-mortem. The series of murders reawaken Dantzler's memories of his own mother's murder when he was still a young boy. As he delves deeper into the case, haunted by thoughts of his mother, Dantzler must first regain control of his own emotions. 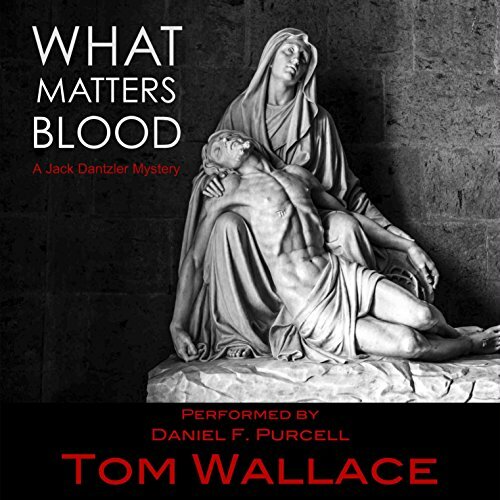 What Matters Blood presents Dantzler with his ultimate challenge, entering into the dark and twisted mind of a cunning adversary, who will stop at nothing to prevail in what he calls this "Waltz of Death" with the great detective. This was.my first Tom.Wallace book and oh my gosh it is freaking awesome! If you are into crime thrillers than this is a must read, or in this case listen. What's more, the narrator did a fantastic job of portraying the characters. This is definitely a series I will continue.